These organic macarons are handcrafted in the Monastic Tradition by our Nuns. These organic macarons can be a magnificent gift idea for any occasion: Feasts and celebrations of all kinds, throughout the year. Our various box designs in the form of cases are especially made to preserve the freshness of these organic macarons; they enhance the product and give it a more select style. 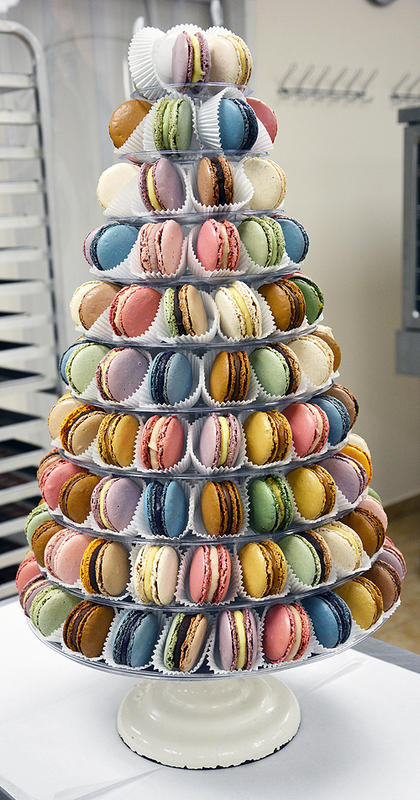 The Macarons are layed up in the shape of a small tower or pyramid à la française; very popular as well at St Roger Abbey's, to offer our customers the more elegant and very French note: for Weddings, Holy Communions, Child Births, Birthdays & Anniversaries, Business Meetings and more. This very savory small cookie, slightly crunchy and filled with fruit aromas (obtained from real organic fruits) reveals you the French Gastronomy and Savoir Faire in la Grande Cuisine, which has been handed down also in the Monasteries, so well-known for their good table to greet and treat their patrons and visitors.St Roger Abbey's Organic Macarons are in very high demand, for their small bite size so rich in surprises. Macarons' Unique Character in the Grande Pâtisserie Française. Our Macarons are unique, because St Roger Abbey is really the only Pastry Shop that actually handcrafts so many organic macarons, in so many flavors, and on top of this, you are offered macarons that are authentic and simply delicious.